en. The studio has three tattoo artists on staff including Joshula, Leah Goodlett, and Kaelin “Moses” Moser-Viteri. Clients speak highly of the talent as well as the drive and dedication of Joshula and the tattoo artists at his studio. Check out the article and the other honorees here. Thanks to all of our amazing clients and supporters! 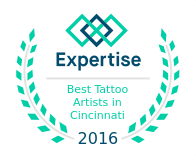 No Replies to "GUTS Selected as one of Cincinnati's Best Tattoo Shops"